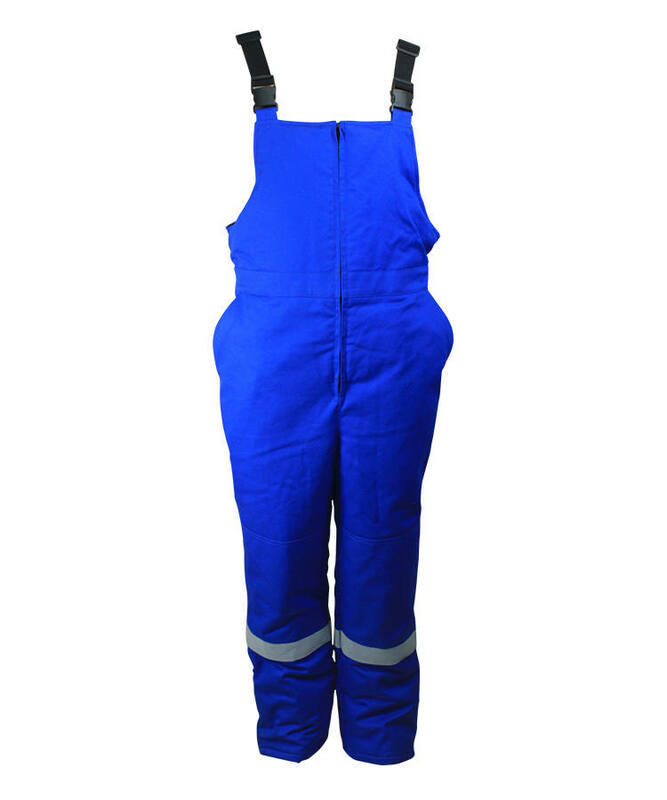 This fluorescent yellow bib pants made of 240gsm 65% polyester 35% cotton fluorescent yellow fabric, and can meet EN ISO 20471, ANSI/ISEA 107-2005 and other standards. The fluorescent yellow bib pants can make the wearer be identified more easier than the surrounding things in poor light and short distance, thus to ensure the safety of the wearer. 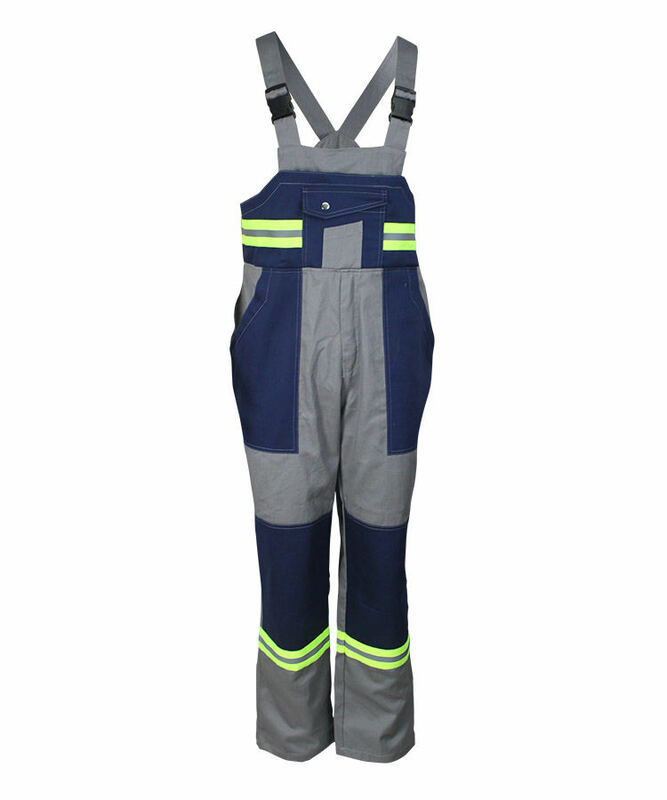 The fluorescent yellow bib pants can provide the wearer good protection in dark condition, especially for policeman work in night, railway workers, offshore and miner. By researched and developed, we also provide waterproof design, as well as a range of additional properties, such as flame retardant, antistatic, chemical resistance, which makes it protecting against complex hazards. Former pocket opening have an irregular patch pocket with flap, snap button closure, on up right of flap, there have contrast color fabric matches, bottom edge have black ribbon, convenient for opening the pocket. 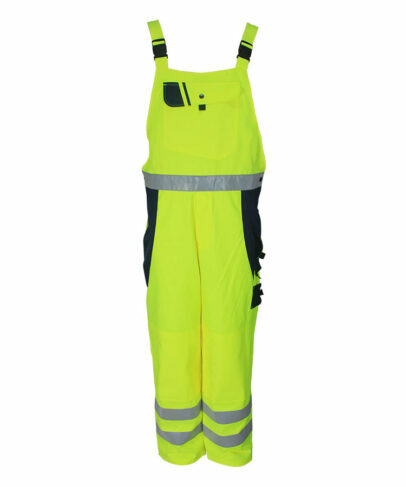 It has a door flap on both sides of the fluorescent yellow bib pants, four eyes button closure, convenient to wear and off. On the right side there has irregular color patch pocket with zipper closure. The lower right corner there has double 2 in 1 tool bag forward to the side seam. 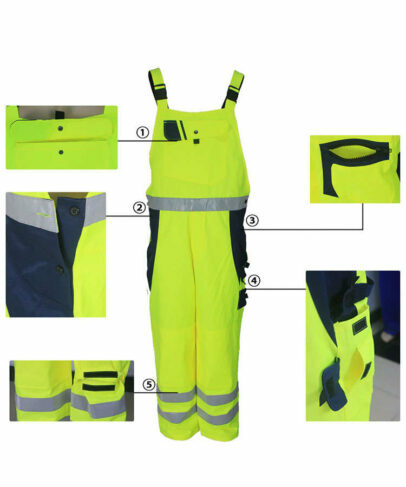 There has an irregular slant pocket on both side of the fluorescent yellow bib pants, on the left under the slant pocket there has a bearing the intersection of 2 in 1 hit color patch pocket with flap, Velcro closure. 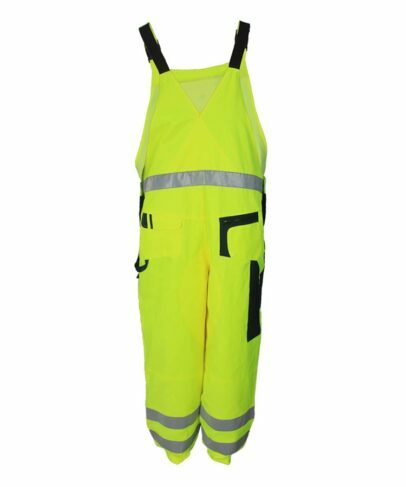 The fluorescent yellow bib pants front legs have knee patch, bottom opening with Velcro closure, can increase knee pad to protect your knees according to need. 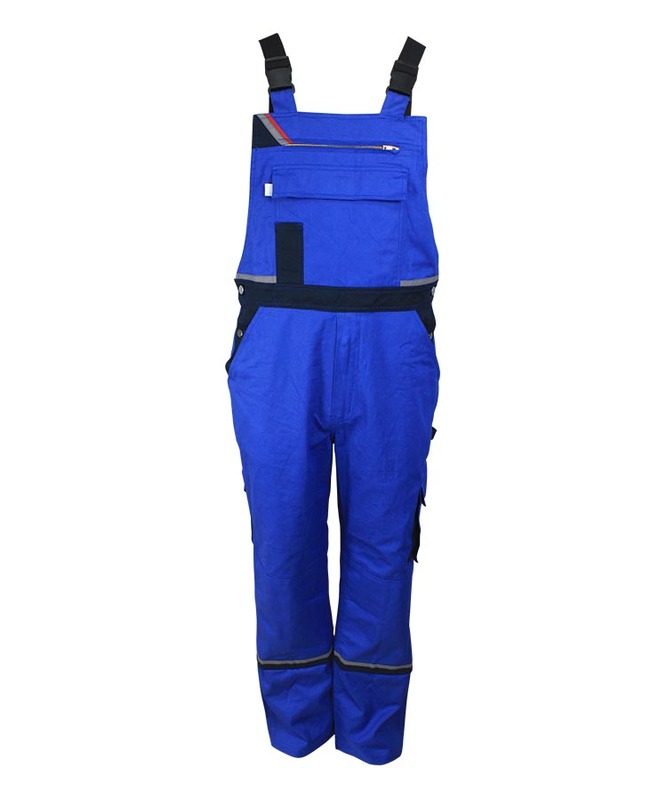 The fluorescent yellow bib pants single closed the front door metal zipper closure. Two 5 cm reflective tape on each leg. 4 cm wide twill elastic band on straps, it can greatly increase the scalability of the straps. 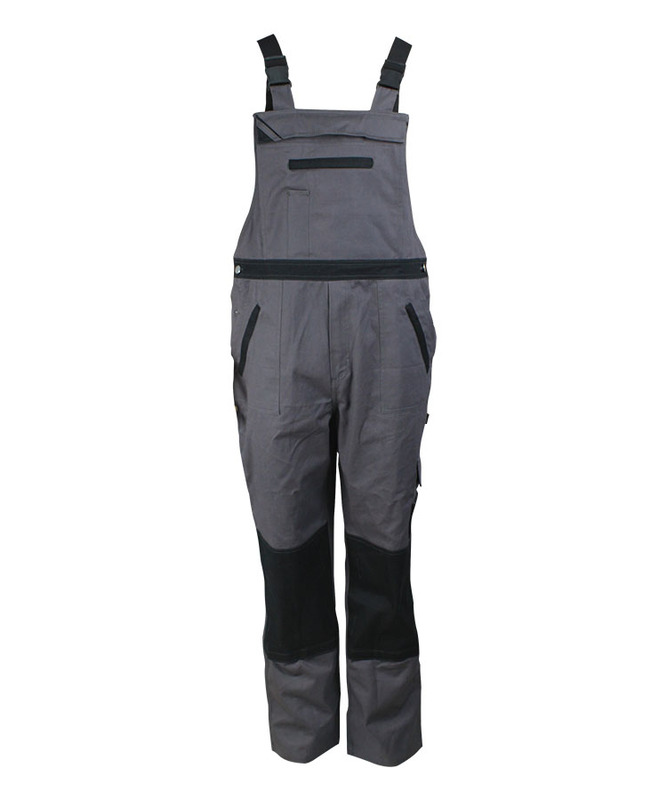 Front pocket opening are connected by a button straps plug + bar adjuster with straps, which can adjust the length of the straps according to the wearer needs. Increased the comfort of the wearer. Back pocket opening have double cross stitching. On front and back waist, there has 5 cm wide hit color reflective tape waist band. Two patch pocket on hips, irregular patch pocket with flaps on left, Velcro closure. The lower left corner loops of tool connection forward to trousers side seam. All the forced parts fixed by bar tack, increasing fastness.